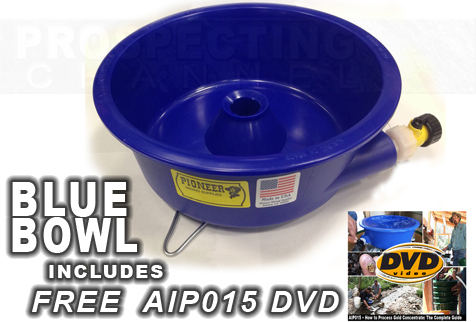 Includes: Blue bowl, Valve, 3 mounting brackets, instructions, How to Process Gold Concentrate instuctional Blue Bowl DVD. Water swirls in Blue Bowl with water pressure provide by a hose. Water carries lighter material to surface leaving GOLD at bottom of blue bowl. FREE DVD: AIP015. How to Process Gold Concentrates Complete Guide)Watch as Rob Goreham walks you through the best method to keep all your gold, including MICRON. See BLUE BOWL set up for the most effective way to get gold even under 100 mesh! Watch as the FALCON gold detector calls out gold that is hiding in your gravels! See the KEENE Super Recirculating Concentrator with the KEENE Miracle Mat collect gold 1/4" Mesh and below. Watch the Heavy Hitter Sluice Magnet pull black sand before it gets to your pan. Much, much more tips and technique that will yield higher gold recovery ....DVD has a special bonus feature: Prospectors Casey Kelton and Joey Wilson do some sluicing in the California Motherlode Country and recover nice gold using a high powered magnet that removes the iron as the material runs through their sluice. Segment is only available on the DVD version of this episode. We ship same day or next business day. USA, Canada,Europe, Ireland, UK, Australia, New Zealand payment available via PAYPAL Accepting Major Credit Cards. Your shipping address must have a Confirmed Paypal Shipping Address Status. This means that your shipping address must match your credit card billing address and be registered with Paypal. This is a simple process that you can take care of through Paypal. WE SHIP WORLD WIDE VIA WESTERN UNION PAYMENT & FEDEX SHIPPING. Contact us via e-mail to place orders, arrange payment and shipping destination. International Shipping Questions. Includes: Blue bowl, Valve, 3 mounting brackets, instructions, Leveler Kit, How to Process Gold Concentrate instuctional Blue Bowl DVD. Fit on top of standard bucket. Attach hose to included valve. 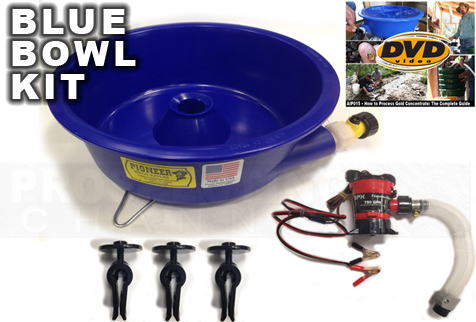 Includes: Blue bowl, Valve, 3 mounting brackets, instructions, 12V Pre-Plumbed Pump wired with clips, Leveler Kit, How to Process Gold Concentrate instuctional Blue Bowl DVD, FREE SHIPPING within USA. 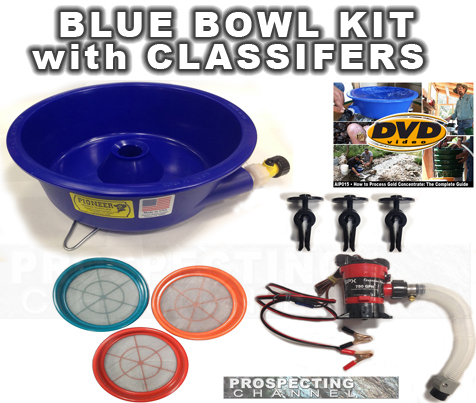 Includes: Blue Bowl, Valve, 3 mounting brackets, instructions, 12V Pre-Plumbed Pump wired with clips, Leveler Kit, How to Process Gold Concentrate instuctional Blue Bowl DVD, 30, 50 & 100 Mesh Classifers. FREE SHIPPING within USA. 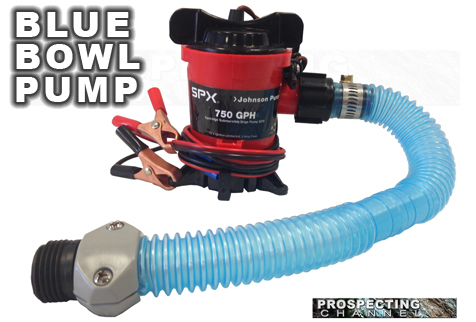 The 750 GPH pump is designed to attach to a regular 12 volt battery and will supply the required steady water flow for the blue bowl. It comes pre-plumbed, wired easy-to-use positive/negative clips and is ready to use. Add the pump to your Blue Bowl for the perfect water flow and ease in set up. 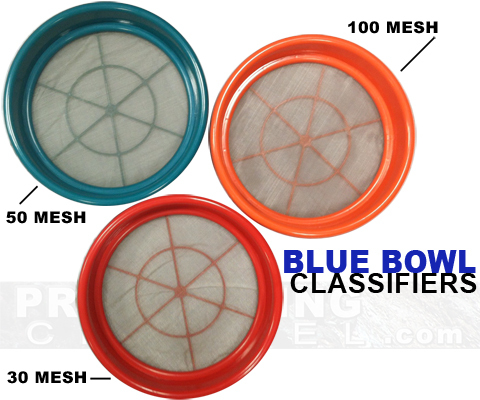 BLUE BOWL CLASSIFIER SET 1/30" 1/50" 1/100"
High Quality Classifiers designed to work with your Blue Bowl System. 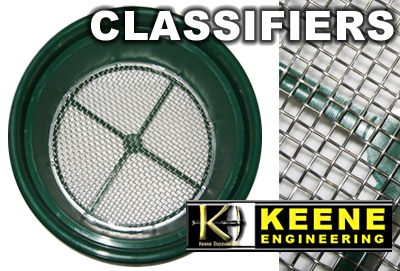 You must have these mesh size classifiers to operate your Blue Bowl System. The Blue Bowl System physics require that you run like sized particulates so that the water can lift the black sand and leave behind your gold in the blue bowl. These 3 classifiers are needed to properly operate your Blue Bowl System. 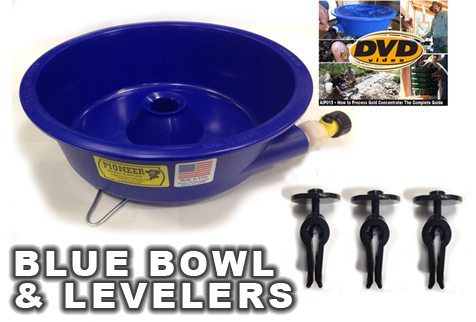 Easily attach your Blue Bowl to a standard 5 gallon bucket. 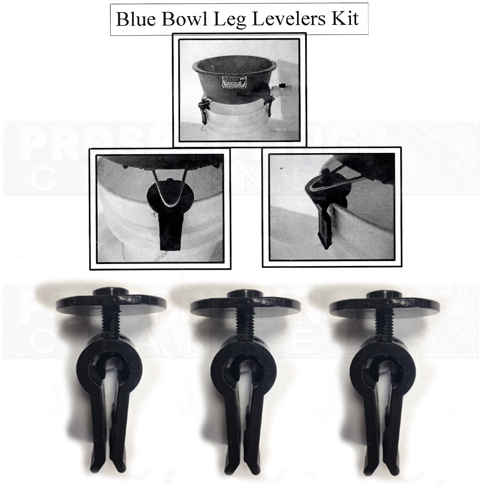 Turn leveler kit dials adjusting height to make Blue Bowl perfectly level for best performance. ©2018 Prospecting Channel Inc. All rights reserved. Unauthorized use of site content is strictly prohibited.